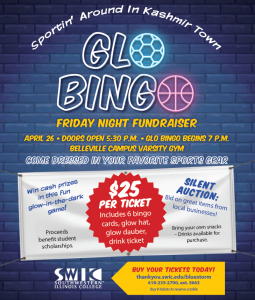 Join us for the annual Glow Bingo Friday Night FUNdraiser on April 26th, in the Belleville Campus Varsity Gym. Doors open at 5:30 PM and bingo begins at 7PM. Dress in your favorite sports attire and play to win cash prizes in this fun glow-in-the dark game! Check out the flier for more information. All proceeds will benefit student athlete scholarships! Buy 8 tickets to reserve a table for your whole group! Tickets can be purchased online HERE. Let’s hit the links and Swing for SWIC on Friday, May 17th at Legacy Golf Course. 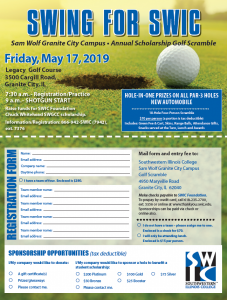 This 18-hole, four person scramble raises funds for the Chuck Whitehead SWGCC Scholarship, designated specifically to help students at the Sam Wolf Granite City Campus with their educational expenses. Registration begins at 7:30 AM with a 9 AM shotgun start. The registration fee is $70 (a portion is tax deductible) per person and includes green fees, cart, skins, range balls, an attendance gift, lunch, snacks, and awards. The scholarship will play a key role in achieving my educational goals. Because of your generosity, the financial burden placed on me to pursue my education is reduced.